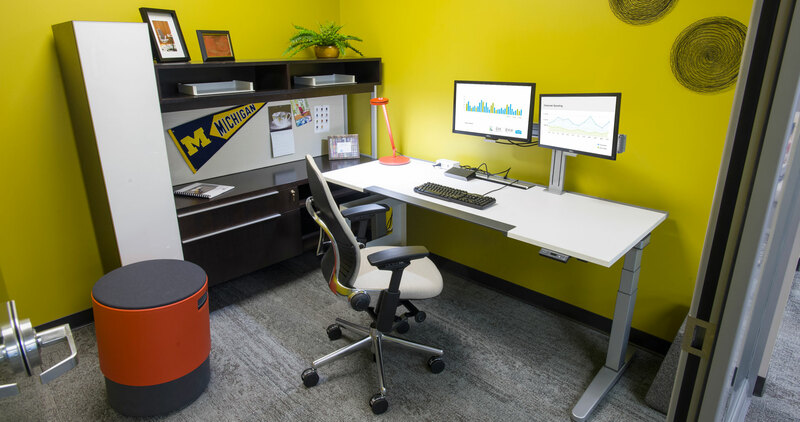 With six team members separated over two Ann Arbor offices, NBS decided it was time for their local team to be in one space. 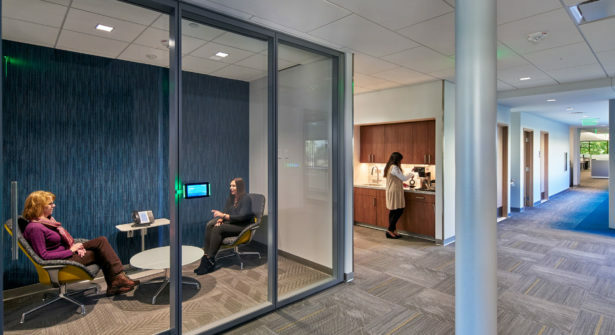 The goal was to create an environment that delivered an authentic, on-brand office space that showcased NBS’s capabilities to integrate architectural products, floorcovering, furniture and technology, all while working within a tight time frame and budget. 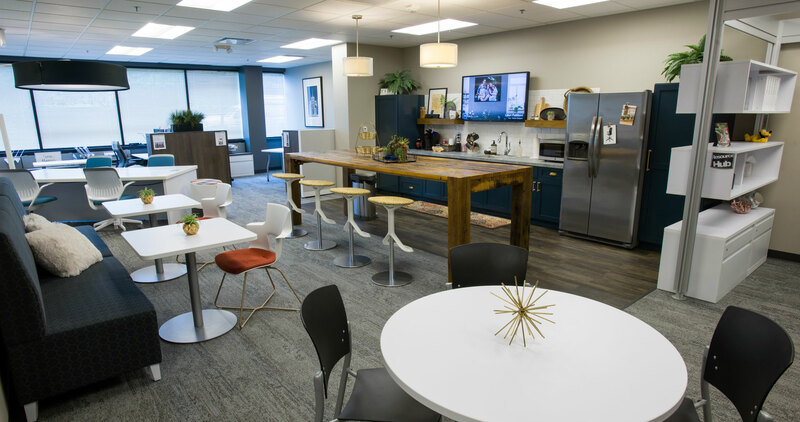 The internal team quickly pulled together the newly rented office primarily using re-purposed furniture from other projects and NBS locations. 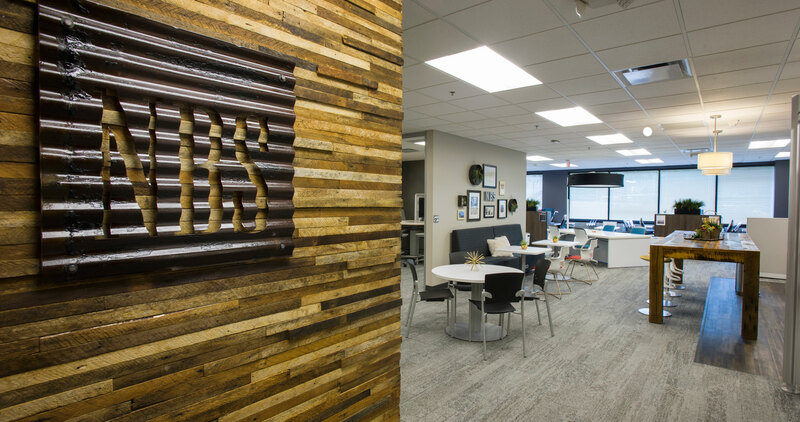 But the cohesive, purposeful look they achieved starts right at the front door to the suite, which incorporates corrugated metal branding of the NBS logo in the entryway. 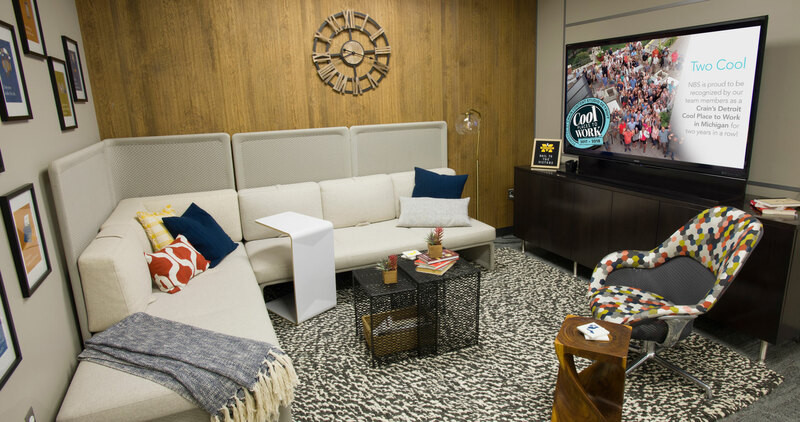 Thoughtful accessories, greenery and artwork create a comforting, homey vibe throughout the new office, which also includes many tactile materials, from reclaimed wood to plush fabrics and metals. A wall of windows brings much appreciated daylight into the space; pops of color throughout create a feeling of brightness; and a cozy café space is reminiscent of a high-end kitchen, with custom cabinets and a reclaimed wood island. 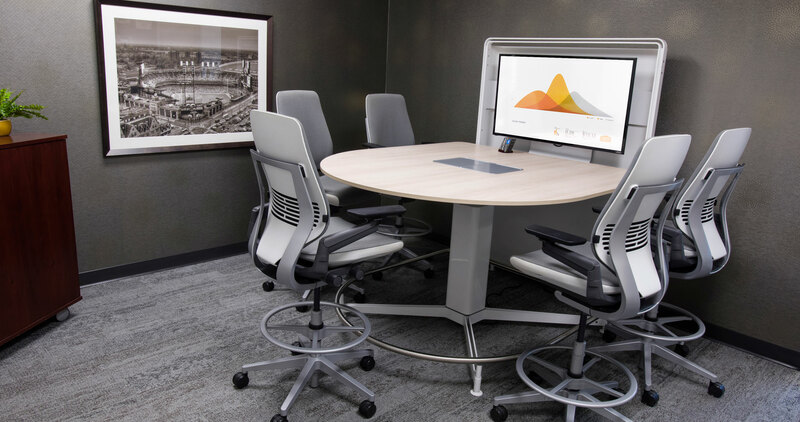 The new space boasts one private office, one focus room, six resident workstations and sixteen seats for collaboration in a variety of settings and postures for team member use. 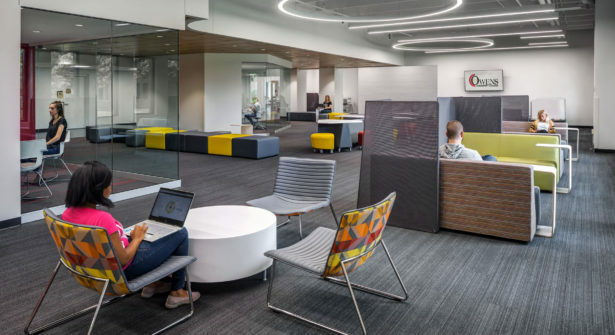 Plus, many areas pull double duty, with the copy area moonlighting as a material library, the café hosting informal meetings and the living room offering ample opportunity for group collaboration. 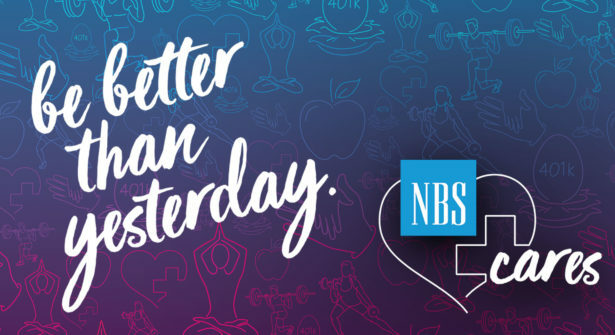 NBS’s Ann Arbor office now reflects the look and feel of its five other showrooms, and the Ann Arbor team is able to collaborate as never before. All of this was accomplished as a pilot project, as the NBS team tested out a new project management system, Procore. 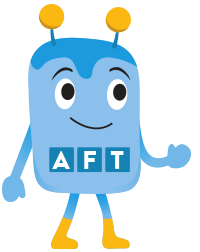 This new tool gave all team members involved access to shared drawings and documents anywhere at any time. Communication, project timeline and action items were all managed through the system. “Space matters and NBS designs spaces, but I’m still shocked how much of a positive impact a new environment can have! I feel like I have a new job with a new company. 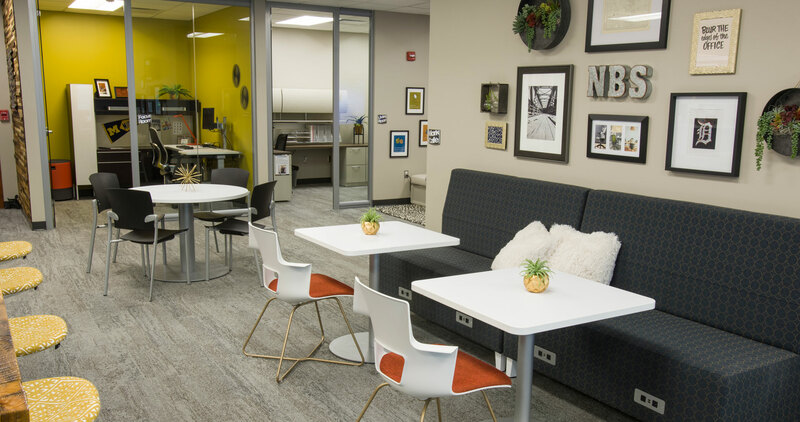 The sunny cozy space is a perfect setting for heads down and collaborative work with team members who are – right there!” – Susan Young-Schmidt, NBS Workplace Specialist, Ann Arbor. This project showcases the power of NBS AFT integration (Architecture, Furniture and Technology). We believe that when these three disciplines are brought together early in the planning process, good things happen. 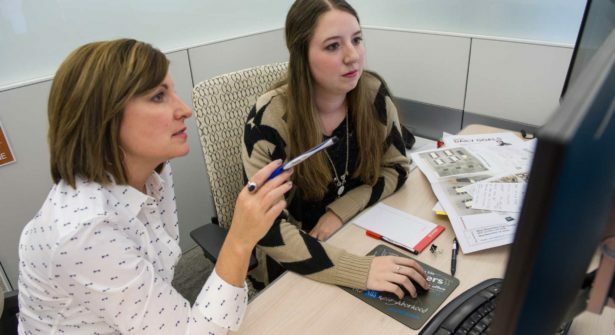 Fewer errors occur, efficiency improves, and your stress goes down — because we handle EVERYTHING. Expect more from your space. Learn More.